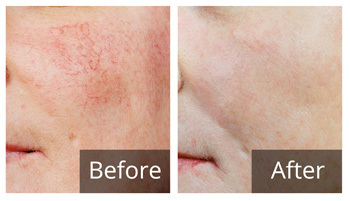 Laser Removal of Fine Thread Veins and Various Other Red Blemishes. This generation of lasers has revolutionised the once painful and invasive procedures formerly used making this a fast, easy and effective treatment. "No more long skirts hiding legs I was ashamed of! I found the Northampton Laser Clinic to be exceptionally professional with clearly many years experience. A really friendly bunch. Large areas of thread veins on my lower legs have been successfully removed in 3 sessions. Worth every penny and less expensive that I expected." They are usually one of the easiest blemishes to treat and the quickest to respond to laser treatments of all the laser procedures we do here. Veins and blood vessels deliver a healthy blood supply to the skin but when they develop too close to the surface, they can cause superficial marks and blemishes. From time to time, especially with skin exposed to the elements, thread veins are usually not harmful but just plain annoying. Thread veins can give an aging ruddiness to the face and odd red blemishes can look like a spot. 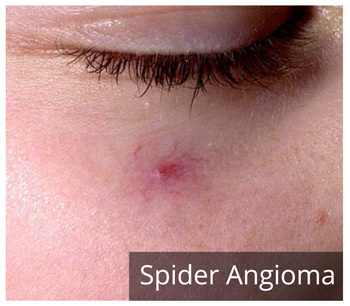 We can treat these which are typically on the face and legs but sometimes elsewhere also. "I had facial thread veins for years on my face and was just fed up wearing thick foundation. After only 2 treatments, I don’t have to wear the make-up and feel so much more confident! ~Would recommend anyone to have it done and Hazel and her staff are brilliant." Lasers work by producing light of a very specific wavelength. 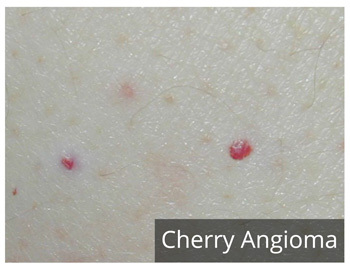 If the wavelength of the laser is matched to the target colour (such as the red of blood vessels) the energy of the laser is absorbed by the vein or blemish but not by the surrounding skin. The damaged veins are gradually dissolved and removed by the body’s immune system, fading over several weeks after treatment. The number of treatments needed will depend on the area of the body and the density of the vein or blemish and will be estimated at your consultation. It is unusual for less than 2 treatments to be required. Treatments are planned at four, six or eight weekly intervals depending on the area being treated. 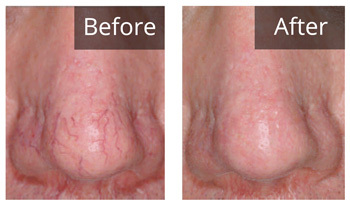 We can tell you more about thread vein and red blemish removal and how long it might take at your consultation. It’s free and allows you to be fully informed in a non-sales pressure, friendly environment before you commit to treatment.